=LOVE will perform at Laguna Music Fes on 3/23! members started rehearsing for solo concert! =LOVE will be a special guest of UNIDOL, a competition between amateur idols formed from university students, on 2/13! 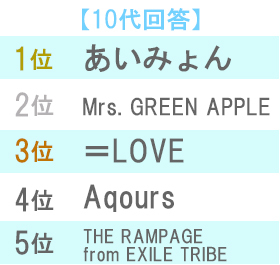 =LOVE ranked 10th in another "Next breakthrough artist in 2019" top (3rd among teens)! Shoko will appear alone on a TV show Honnou Z as a "new cooking talento" on 2/20! as expected, the 5th single was announced at today's solo concert! the title is Sagase Diamond Lily (Search for Diamond Lily) and the release will be on April 24! their first tour "Ima, Kono Fune ni Nore!" was also announced! @fatrain great news! thanks! Happy to see 5th single announced and finally a tour! =LOVE's first solo concert "Hajimemashite, =LOVE desu"
M18 Want you! Want you! E01 Ima, Kono Fune ni Nore! My favorites members are Hana, Anna, Iori, Nono and Emiri. My favorite songs are Kioku No Dokoka De, Teokure Caution and Want You! Want You! Anna designed t-shirts for her alma mater's (Actor's School Hiroshima) 20th Anniversary! Are there any TV Shows of them or at least some as guests? Would like to get in touch with them. Anything subbed would be great. unfortunately, they are not in English. those are basically the only TV variety shows =LOVE members have been on ^^; there were occasional TV appearances on some music shows or solo appearances of some members (Sukatto Japan, AKB48SHOW), but nothing noteworthy.